Designed with the small organ in mind, and based upon an earlier range of blowers (Code named ELFIN to AVON) that are already installed in a great many churches throughout the world. These machines are capable of delivering a useful wind supply from modest dimensions. Suitable for installation within the organ, or adjacent to it in a suitable acoustic cabinet. Normally supplied enclosed, mounted by means of our spring suspension system to minimise the transmission of any vibration. 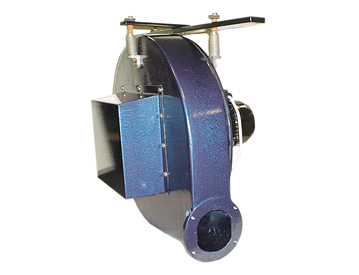 All models can however be supplied in free standing form, or as a ducted inlet booster. Construction is of cast aluminium and heavy gauge steel plate. All models have aluminium impellers and are fitted as standard with carefully selected TEFC motors, running at 2800 rpm (3450 rpm @ 60 Hz). Please note that enclosed models are not available with L90 or R90 outlet positions. Designed for small to medium sized organs. A good standard of quietness in operation enables these machines to be installed inside, or close to, the organ, using an appropriate acoustic cabinet. These machines are constructed of heavy gauge steel plate and have aluminium impellers. 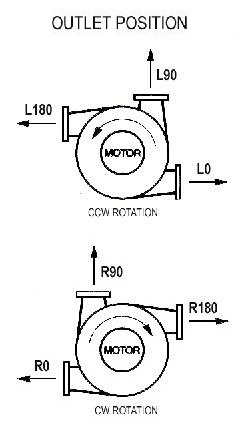 All models are fitted as standard with carefully selected TEFC motors running at 1450 rpm (1750 rpm @ 60 Hz). Enclosed models feature our self-sealing sleeve as standard. This not only facilitates installation, but also allows the equipment to be moved with little trouble, improving access during servicing or maintenance operations. Designed to give a high efficiency providing a large air output with relatively low power consumption. Because of their higher operating efficiency, care should be exercised when choosing an installation site for any of these machines. Construction is of heavy gauge steel plate with aluminium impellers. The ¨R¨ suffixed models operate at a slightly lower efficiency than the other machines, with their emphasis being on volume movement rather than pressure. 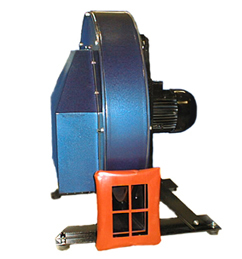 All models are fitted as standard with carefully selected TEFC motors running at 1450 rpm (1750 rpm @ 60 Hz). Acoustic cabinets are available to suit each model. These cabinets are constructed from quality plywood with varnished finish. The cabinets are lined with acoustically absorbent foam that is certified fireproof to class 0 of the current UK Building Regulations. All models feature an insulated inlet cowl with integral inlet flap to further reduce the breakout of wind noise. Special lining materials, having superior acoustic properties, are also available for noise critical installations. We are always happy to discuss your individual requirements. Machines supplied for ¨unenclosed¨ operation can optionally be fitted with discharge expanders, maximising volume flow, spigots or (where applicable) ¨rectangular to round¨ flexible fabric sleeves. We would be pleased to provide details and prices upon request. To assist you in specifying your requirements, please refer to the diagram to the left which illustrates the outlet positions available. All of our blowing equipment can be supplied with motors suitable for either single phase (230v 50Hz), or three phase (415v 50Hz) operation. We are of course always happy to discuss your requirements for alternative voltages or frequencies for export orders etc.